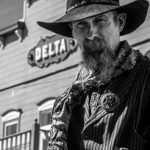 Nathan Hughes enjoys the reputation of a ‘gentleman gunman,’ an oxymoron in most parts of the Wild West. Living in an era of ‘shoot first, ask questions later,’ Hughes is known as an intellectualizer and humanitarian, willing only to make the ultimate show of force when innocents are in mortal danger. It surprises most to learn that, aside from target practice, he’s only blasted through 5 of the 6 bullets in the chamber of his revolver. However, because his shot is dead on, he’s kept the streets a little safer for his lady admirers – now that’s chivalry! Aside from his impressive shooting skills, Hughes is also known for his sharp style of dressing. The polish on his boots is perpetually high-shine, even on rainy days, and he has a wardrobe full of vibrant waistcoats suitable for every occasion. He much prefers spending time in fancy parlors with lovely ladies discussing theatre and modern philosophical subjects, but can be counted upon to enter the fray when needed. His witty repartee makes him a favorite among the local hostesses, but they truly appreciate his ability to keep the peace with his excellent marksmanship. Note: pictured vest and shirt have been discontinued. We recommend the Black Cherry Jacquard vest and Wyatt Stripe Shirt, linked below. This holster fit my S&W 629 perfectly--they were made to be together. Another successful purchasing experience! It is great to know t hat when I place an order, it will be processed in a timely manner and meet my expectations. The order was prompt, well packaged, and in great condition! We ordered several items of clothing for a wedding. Generally, the sizing guidelines were spot on. One item had to be returned for a different size, and working with Historical Emporium's customer service was extremely easy, and the exchange was accomplished quite quickly.